1555 As the president-elect hones his physique, with the warm words of predecessor George W Bush ringing in his ears, it is time to bring our own marathon live text commentary - which began 29 hours ago - to a close. We have tried to avoid the word "historic" to describe these events, because we are not historians and in no position to judge. But, as journalists, it has been fascinating and exciting to cover this election. Please join us again soon on the BBC News website for more live coverage of the world's biggest events as they happen. 1548 He "shot some hoops" on the basketball court on Tuesday while voters filed in to polling stations. Now we are informed that Mr Obama is in the gym to work out some of the stress and strain of the last two years, and perhaps build up some stamina for the challenges ahead. John Allen, London, UK: North America is leading the way to shedding the past of racial discrimination towards true racial equality. I hope that South America, Europe and Australia will follow suit. More of your comments. 1529 Historian Stephen Hess says the meeting at the White House between Mr Bush and Mr Obama - which Mr Bush has promised - will be "more than symbolic", with the incumbent perhaps trying to impose his ideas on his successor. 1525 Mr Bush says he will keep the president-elect fully informed of decisions. He expresses his "profound gratitude" for serving the US. Senator Obama's mother and grandparents would have been "thrilled", he adds. 1523 President Bush says he has had a "warm conversation" with Mr Obama about his "impressive victory". He promises "complete co-operation" during the handover. He says the nation will "always be grateful" to Mr McCain for his service. All Americans can be proud of Mr Obama's "journey", which is a "triumph of the American story", Mr Bush adds. 1517 The incumbent president, George W Bush, is expected to give a statement soon on Mr Obama's victory. Michelle Malkin's blog: There is no time to lick wounds, point fingers, and wallow in post-election mud. I'm getting a lot of moan-y, sad-face "What do we do now, Michelle?" e-mails. 1510 Mwai Kibaki, the president of Kenya - where Mr Obama's late father was born - has declared a national holiday for Thursday. He said: "The victory of Senator Obama is our own victory because of his roots here in Kenya. As a country, we are full of pride for his success." 1502 On the cabinet-building front, ABC News reports that Rahm Emanuel, a House of Representatives Member for Illinois - Mr Obama's home state - has been offered the job of White House chief-of-staff. Mr Emanuel has not given an answer, it adds. 1453 Sir David King, former UK government chief scientist, says Mr Obama is a "visionary leader" on the environment and that Europe and the US can now "pull together" to cut emissions. 1451 UK International Development Secretary Douglas Alexander says Mr McCain lacked a "clear centre-right view of how to deal with the economic crisis". 1448 Still no news on whether Mr McCain or Mr Obama won Missouri and North Carolina - and that one final electoral college vote from Nebraska. Mr Obama is just one vote from what would be regarded by many as a landslide victory. djangel17 tweets: Having a Great Birthday today! !...….If you Like Obama or not we must support him and unite….Let's move forward…. Read djangel17's tweets. Matt Emerson, New Orleans, US: It is unfortunate that Mr. McCain decided that he had to present himself as directed by the Karl Rove school of campaigning. He is a sensible man with a more moderate outlook than most realize. We had a choice between fairly high quality candidates for a change from recent contests. Even though I voted for Mr. Obama, I was surprised by how much I was moved by his election. I think he will make some improvements, but it is unlikely he can live up to the hype. More of your comments. 1438 Wall Street has opened. It will be interesting to see how shares go. The Dow Jones is about 150 points down. After the Obama party, the reality of economic woe is creeping back towards the front pages of the newspapers. Jacob, Camden Town, London, UK: As an American living in the UK it is an odd time to be witnessing the arrival of a new president. I have seen others come and go and have come to realize that the only change that ever really occurs under a new administration is the name on the tea towels.The USA will not suddenly rise up and become an elightened beacon of anything just because a man of mixed race was elected. How ignorant are the voices of the people (ie celebrities) to go to the media and say otherwise. More of your comments. 1430 Amid all the back-slapping and compliments for Mr Obama, has France's human rights minister Rama Yade outdone all others in her predictions for the forthcoming presidency? "This is the fall of the Berlin Wall times 10," she told French radio. "America is rebecoming a New World... We all want to be American so we can take a bite of this dream unfolding before our eyes." Talk about great expectations. 1421 Pope Benedict has sent the president-elect a message. "It asks for God's blessings on the American people so that, together with all people of goodwill, a world of peace and justice can be built," a Vatican spokesman says. 1415 Film director Spike Lee tells the BBC: "I never thought I would see it [Mr Obama's victory]. Thank God I was here to witness it with my own eyeballs." It does not "signal the end of racism" but is "just the beginning", he adds. 1411 German Chancellor Angela Merkel has congratulated Mr Obama, while being strangely secretive about her night-owlishness and viewing/listening/reading habits. She told a press conference: "Of course I followed it (the election) until I went to bed - I won't tell you at what time. Even though if you go to bed at a normal time in Germany you wouldn't know the result. During the night I informed myself - I am not going to tell you via which media - and then I went back to sleep before starting my working day." Please say you used the BBC News live text service, Frau Merkel. 1409 President Obama car bumper stickers are already for sale in New York. 1408 There really is only one story in town. The top 100 terms searched for on Google today all relate to the US election or Barack Obama, according to Sky News. Pekka in Helsinki, Finland says: After eight years of Bush rule, I really hope there is a change for the better. Also big hand to McCain for giving a sincere and honourable comment about Obama's victory. More of your comments. George in Vancouver, Canada says: Every Canadian I knew had their eyes glued to the screen today. This election was not just about America - people around the world over have been inspired by America's decision. We were, in the words of John Mayer, "waiting on the world to change." When Obama's big win was announced, I wanted to hug the person next me! More of your comments. 1345 Well it's been short but sweet. Justin has returned from his break to take back the helm. 1340 An emerging theme has been the heavy weight of expectations bearing down on the president-elect. Syrian Information Minister Mohsen Bilal has now said he hoped for "a change in US foreign policy" that will boost the Middle East peace process. 1333 It looks like we can expect more geo-political fun and games between the US and Russia after Mr Obama takes office. Russian President Dmitry Medvedev said Moscow would base missiles in its eastern European enclave of Kaliningrad if the Obama administration continued with President Bush's proposed European missile defence shield. Leslie Xavier in Italy says: Democracy means nothing without the participation of all peoples involved. Young Americans have finally grasped this concept and have been rewarded in choosing to go to the polls instead of the malls. It has been a pleasure to watch this election. Both Obama and McCain have run a good race, one that challenged the American public to take notice of the direction of their country's policies on a global scale. More of your comments. 1319 Iraq's Foreign Minister Hoshyar Zebari has hailed what he called an "astonishing victory" for Barack Obama. "I think it is indeed an historic victory, and also we believe that there is a great deal of common ground between the president-elect, or the next president, and the Iraqi government to work together as partners in order to achieve their common goals, which is stability in Iraq and in the region." 1313 London mayor Boris Johnson has weighed in with his thoughts on the election. He told the BBC: "America is the last best hope of Earth. For people that love America, it's been a tough few years, the election of Barack Obama restores faith and hope." Alex Chapman in Chicago, US says: Just got back from the Grant Park celebrations. A great night and hopefully finally America has woken up. As an English citizen permanently residing in the US, let's hope us English can now follow suit with a new resident at No 10! More of your comments. B in Maui, Hawaii says: Congratulations to Hawaii's native son! I can't even begin to explain the relief, jubilance, and satisfaction knowing that the US has finally elected someone our country, and the world, can respect. As a white person living in a very racially diverse population, I welcome this new face to American politics More of your comments. 1303 OK. I'm going for a break now. I leave you in the hands of my knowledgeable colleague Michael Dobie. 1301The question on everyone's lips: what will the Obama family call the new White House puppy? How about Santos, after the fictional presidential candidate in the West Wing whom actor Jimmy Smits modelled on Mr Obama himself? Or Kogelo, like the Kenyan village where his late father was born and raised? Tony Blair was often regarded by his detractors as George W Bush's "poodle", so, for the sake of UK-US relations, Gordon should be out of the question. 1255 Leading US journalist Tina Brown says she would not be surprised if the Clintons are "enlisted" by the president-elect. 1250 Former Republican Secretary of State Colin Powell, who switched his allegiance to Mr Obama during the campaign, says: "President-elect Obama is going to be a president for all America ... He also happens to be black, which makes it a very, very historic occasion." 1246 Civil rights campaigner Jesse Jackson, who was seen crying with joy at Mr Obama's victory rally, tells the BBC: "We have seen a sea-change in American politics and Barack embodies it. The walls are coming down. He's a great bridge-builder." 1243 As morning breaks in the eastern states, columnist Ann Coulter tells the BBC that the Obama victory is "not a watershed" in politics and attitudes. The only group among which he has massively increased the Democrat vote is African-Americans, she adds. 1238 Former South African president Nelson Mandela has written a letter of congratulations to Mr Obama, saying: "Your victory has demonstrated that no person anywhere in the world should not dare to dream of wanting to change the world for a better place." Andrew Warmington in the UK says: I put money on McCain to win, confident that people were lying to the pollsters about their intentions as they did in the UK in 1992 and that there was enough covert racism to make the difference, especially given that McCain was the least appalling Republican candidate since Eisenhower. I've never been so glad to lose money. Welcome back to the civilised world, America. More of your comments. 1229 Spanish Prime Minister Jose Luis Rodriguez Zapatero says he is "completely convinced" that relations with the US will become "more positive, with more shared projects" when Mr Obama is president. James Deane in the US says: I am a US voter that voted for John McCain. In most elections that I have voted in, I have felt sincere sorrow when the person I decided to vote for lost. In this election I do not feel the same way. I am proud. More of your comments. 1221 Joe the Plumber has spoken. It seems he regrets the level of exposure he had from the McCain campaign. He tells the Guardian newspaper: "You know, fame is fleeting, leaves you hungry, leaves you cold, leaves you tired. Fortune never comes with it." 1212 UK Conservative Party leader David Cameron praises Mr McCain, "not least for the gracious way" he conceded the election. Following Mr Obama's victory, he questions Prime Minister Gordon Brown's often-used criticism of himself that it is "no time for a novice" to run the government. 1207 Polish Foreign Minister Radek Sikorski says he expects the incoming Obama administration to go ahead with the European missile defence shield, parts of which will be located on Polish soil. 1205 UK Prime Minister Gordon Brown tells the House of Commons in London that Mr Obama represents a "change of history". 1204 UK Member of Parliament David Lammy, a friend of Mr Obama, says the president-elect's experience "is roundabout the same as Tony Blair's" when he was elected prime minister in 1997. He says Mr Obama starts with "tremendous goodwill". Jason_K tweets: McCain created his unruly crowd. There's Palin's "real America." 8 years of GOP policy to divide instead of unite causes that. Good riddance Read Jason_K's tweets. 1157 Former Bill Clinton adviser James Rubin says Mr Obama's victory is exciting in its potential to enthuse hard-to-reach people about democracy. He tells BBC Two's Daily Politics: "The people you would normally worry about meeting your daughter were dancing in the street." Hamed in Mazar-i-Sharif, Afghanistan says: Well, it is a really historical result for the US democracy. However, I as an Afghan, feel concerned about the future of Afghanistan because Mr Obama had announced that he would oust the US troops from Afghanistan and end the US war with al-Qaeda. The question is what will happen to Afghanistan and the Taleban? More of your comments. 1148 Just a reminder for those of you interested in UK affairs. Prime minister's questions, featuring Gordon Brown and a whole host of angry rivals, is now up as a live text page. Mr Obama is likely to mentioned. Charles in Washington DC says: My grandfather served in the US congress in the 50s and 60s. He was voted out of office for the crime of voting for the early civil rights acts. I cannot promise immediate change, but know this: My children will grow up in a world where anything truly IS possible. Their world will be one populated with the feeling that we ARE only as strong as those who need our help. More of your comments. 1119 Joe the Plumber has taken his last ride on John McCain's Straight Talk Express. Many will miss him. People in the UK will find it hard to imagine there was such uproar at his reported $200,000-plus-a-year income, such is the difficulty and expense of getting hold of his fellow tradesmen. If he were British, Joe would undoubtedly get his own reality TV show. Pipe Idol? Brendan Payne in Edmonds, US, says: I voted for McCain and disagree with much of Obama's policies, but this is an historic day for the United States. Ideology aside, we must come together as Americans to celebrate this great hammer blow against the walls of racism in America. More of your comments. 1058 Did you know that Brad Pitt was at Mr Obama's victory rally in Chicago? I saw Oprah Winfrey and Jesse Jackson, but not the international film star. It must have been a big event to get him off the TV. Or did the camera operators not notice? Or was it just me? Strangely the father of Mr Pitt's wife Angelina Jolie - Hollywood actor Jon Voight - is a McCain supporter. 1051 What next for Hillary Clinton? Will Mr Obama bring her onto his team, despite the intensity and bitterness of their rivalry during the Democratic primaries? It is rumoured that she might get a role in developing healthcare - some unfinished business for Mrs Clinton, who had a similar job when her husband Bill was in the White House. 1042 Nick Clegg, leader of the UK's third party, the Liberal Democrats, says the US is "leaving the Bush era firmly behind" but warns that the "weight of peoples' hopes and expectations on Barack Obama is immense". 1037 The UK's former Washington ambassador Sir Christopher Meyer says that, despite Mr Obama's inexperience of world affairs - a frequent criticism from the McCain camp - he can rely on his team of advisers. He adds that "it would be an enormous mistake to think of him as some kind of political virgin who is suddenly going to find himself in the Oval office having to learn the ropes very, very fast". jeilerman tweets: What an awesome nite ! Obama this beer is for you! Read jeilerman's tweets. 1026 The BBC's Jon Leyne in Tehran says: "Iranians will be celebrating the victory of Obama, whose name means 'he-with-us' in Persian. Until the last moment, most people here simply could not believe that the United States would ever vote for an African-American. It's widely believed here that President Ahmadinejad himself is looking for a reconciliation with the United States. But there are many conflicting views amongst the Iranian ruling elite, and the president himself is known for an approach to diplomacy that is, to put it mildly, rather eccentric." Keelan Dennis in Springfield, Oregon says: The election of President Elect Obama will have huge repercussions across the US. I have hope for my nation for the first time in a long time. I believe in my fellow Americans. We put aside the politics of fear and took a stand for the person we believe is right. We spoke with a loud voice, calling for change and stating that the person and their ideas are more important than race or gender. I feel that, for us, tomorrow really is a new day. More of your comments. 1018 The party room for the McCain campaign in Phoenix, Arizona, still looks a mess. There are bits of paper all over the place. Hopefully the cleaners will give it a better go in the morning. Perhaps they are too dejected about the local boy's fate. 1008 I wonder how Mr McCain views his loss. Is it easier to take than in 2000, when he was beaten by George W Bush to the Republican nomination? The wisdom in football - or soccer, to our US readers - is that it is more disappointing to be eliminated from a competition at the semi-final stage than to lose the final. At least Mr McCain's name will appear in even the most basic historic accounts of this election. At least his doesn't have quite the same sense of "What if?" At least he has been to the "show", not just the very public auditions. 1001 It still seems that nothing could be finer than the result from North Carolina. So far it looks like 49.8% for Obama and 49.6% for McCain. There are several other issues on the ballot which could be delaying the count. 0957 Is it a double win? In Tuesday's live text, we mentioned that two American bison - named John and Barack - were engaged in a popularity contest among staff at the UK's Whipsnade zoo. Well, the law of the jungle - or is that the prairie? - dictated that only one beast could succeed. A zoo spokeswoman says: "Barack won hoofs down, thanks to his friendly personality and hairy good looks. 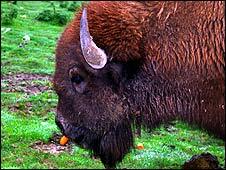 He is currently munching on his carrot, triumphantly, while John watches from the sidelines. Keepers have commiserated with him and he's had some hay to compensate." A bitter taste indeed, one imagines. Richard Pollard in Boone, US, says: If there wasn't the Bush Republican stigma from the past eight years attached to this election and if both ran with out party political rubbish do you really think that Obama would have beaten McCain in an individual election? More of your comments. 0943 Mr Obama and Vice-President-elect Joe Biden have to resign from their Senate seats. There is no set time for this - as long as it is before noon on inauguration day. 0940 What happens next? Well, with 11 weeks to go until Mr Obama is sworn in as president, John Podesta, a former chief of staff to President Bill Clinton, has been asked to oversee the White House transition for the Democrats. The 538 electoral college votes provided by the 50 US states are not actually "cast" until 15 December, in what is a ceremonial but constitutionally necessary event. A joint session of Congress on 6 January will count the votes, with Mr Obama inaugurated two weeks later. Joan, Sheffield, UK: I think Obama is a very brave man but whether he can live up to the expectations that have been placed on him remains to be seen, never has a President carried with him the hopes and dreams of so many Americans. My biggest worry is the threat of assassination, heaven forbid anything happens to Obama or there will be an absolute blood bath. More of your comments. 0924 In the UK, The Times newspaper praises Mr McCain's behaviour during his campaign. It says: "When his more rabid followers wanted to savage Barack Obama with accusations of his being a Muslim, or a terrorist, he restrained them out of natural decency." 0922 The Arizona Star, Mr McCain's home-state nespaper, sounds a note of caution for Mr Obama. It says: "No new president has faced so much since Franklin Delano Roosevelt - and even he didn't have two wars on his plate." 0914 World leaders continue in their lavish praise. Ireland's Brian Cowen says Mr Obama "serves as a beacon of hope, not just in America". 0913 A quick point for those of you who might be wondering why our total amount of electoral college votes declared for Mr McCain and Mr Obama (511) - when added to the 26 left for Missouri and North Carolina - comes to 537, rather than the total of 538. Apparently Nebraska, which gives its five votes out district-by-district - rather than on a winner-takes-all basis - has only declared four of them so far. Problem solved. 0906 With the contest still very close in North Carolina, libertarian candidate Bob Barr has taken more than 25,000 votes. 0903 UK bookmaker William Hill has installed Mr Obama as even-money favourite to be re-elected in four years' time. A record £10m ($16m) was gambled on the 2008 election, with much of the money coming from US citizens, who are banned from betting on it in their own country. 0856 The US ambassador to London, Robert Tuttle, tells the BBC: "It was a great night for democracy. It was a great night for freedom." He predicts that Republicans Mr McCain and President Bush will "rise above party and above this election to make sure that the president-elect can take office with the maximum amount of knowledge and information, so he can govern effectively". luv2shoppe tweets: Republicans don't see Obama as a black man... just an incompetent, inexperienced man. That is the general consensus. Read luv2shoppe's tweets. 0851 Nurse Nguyen Thi Thanh, who saved Mr McCain's from an angry mob when his plane was shot down during the Vietnam war, says she is glad Mr Obama won. "In my opinion it's better if the US vote in favour of someone who loves peace, and it seems that Obama loves peace more," she adds. Renee M. in Arlington, Virginia, says: I watched the election coverage unfold with my grandmother who was born in Fluvana County, VA in 1923. Though I recognize the historic significance of this election, to see it through her eyes was amazing. She said she was so glad that she lived to see the day because she could remember when she couldn't even vote and had to give up her seat on the bus. More of your comments. 0847 At least Mr Obama's campaign website has something to say: "Thank you." Dan in San Diego, California, says: Amidst all the joy and celebration around the world, I wonder how many of you have looked at the specifics of Obama's policies, including the large protectionist tariffs that he will likely pass, along with further military attacks within Pakistan. More of your comments. 0843 And the latest news from Mr Obama's "Senator for Illinois" site? It reports that President Bush has signed into law the Obama-Murkowski-Allen Bill to Ban Dangerous Mercury Exports. Are his staff working so hard they haven't watched the TV since 15 October? If so, it should make every taxpayer's heart glad. 0836 Terry Nelson, who was Mr McCain's campaign manager until last year, has criticised his former colleague for trying to distance himself from fellow Republican George W Bush. This made his dealings with the incumbent president "negative" and prevented Mr McCain from putting forward a "positive vision", he tells the BBC. Elizabeth in Chino Hills, US, says: I truly hope that Obama does a good job as president but I have my doubts. Obama is an eloquent speaker and could make the phone book sound great but that is here and there. All that is behind him is his celebrity, the image. We'll see. More of your comments. 0830 UK Prime Minister Gordon Brown praises Mr Obama for an "inspirational campaign, energising politics with his progressive values and his vision for the future". David Cameron, leader of the opposition Conservative Party, hails him as the "first of a new generation of world leaders". 0827 Bob Shrum, a consultant who has worked on many Democratic campaigns, tells the BBC: "This country has renewed itself as a great, inspired, creative and unpredictable force in the world, and this is one of the proudest nights of my life as an American, not just as a Democrat." Noor Muhammad in Karachi, Pakistan, says: I hope that US under Obama and Biden is different from the US under Bush and Cheney. If is not, nothing will have changed. More of your comments. 0821 Missouri and North Carolina have yet to declare. Between them they provide 26 electoral college votes. 0820 As expected, Mr McCain has won Montana. This takes him to 162 electoral college votes. 0816 Historian Simon Schama says this is an "indisputably good moment" in a world "full of cynicism". 0814 Grant Park in Chicago is emptying out, as Obama supporters go off for some sleep, or more parties. Times Square in New York still looks lively - then again, it always does. 0812 Mr Obama is projected to win Indiana, taking 11 more electoral college votes. This would take him to 349 votes - one short of what is considered by many analysts to be a landslide. 0806 Perhaps the defining image of the post-election celebrations will be of veteran civil rights activist Jesse Jackson in tears at the Obama rally. It does rather illustrate the depth of change represented by the result. 0803 Unsurprisingly, people in Kogelo, the home of Mr Obama's late father, have been having quite a party. His step-grandmother Sarah Onyango was seen dancing and cheering outside the family house after the results were declared. Mindful of a photo-call, political leaders are expected to descend on the village later. Someone who probably supported the Republicans is the bull due to be slaughtered for the celebration feast. Erick Dillard, Virginia, US: My family came here as slaves in 1703. For the first time in my life I feel like an American. No longer a black American, just an American. This is for my father who died this year before he could see this day. This is a toast to America, may we be truly one nation and one nationality. More of your comments. John Flanagan in Singapore says: A great result and, seemingly, far better than expected by some 'experts'. This could be the day the world changed forever. Let us hope so. More of your comments. 0757 UK Prime Minister Gordon Brown has offered his congratulations to Mr Obama. Douglas Alexander, the country's international development secretary, calls it "a victory for an extraordinary individual" and "a victory for an ideology that says that progressive politics has the answers to the enormous challenges that the United States and the world is facing". 0747 If Mr Obama does get 52% of the popular vote, it will be the best result for any candidate since George Bush senior's 53.4% some 20 years ago. Vijanth in Ipoh, Malaysia says: Today is the day greater than the very day when Martin Luther King made the speech of dreaming of great America. The dream of Martin Luther, 40 years ago, is being made in reality by the American citizens themselves. More of your comments. 0738 The latest BBC projection has Mr Obama winning 52% of the popular vote and Mr McCain 47%. 0736 The town of Obama in Japan has seen wild celebrations after its namesake's victory. Many revellers have dressed in hula skirts in honour of the president-elect's native Hawaii. 0734 Things are incredibly tight in Missouri. The candidates are on 49.4% each, with 99% of the votes counted. Just 400 votes separate them. BBC North America editor Justin Webb: The Obama years will stretch America. The nation will come to think differently about itself. But Barack Obama is too focused and too, well, too midwestern in outlook, to really stick it to the right. He will govern from the centre and relish the battles with his own party that that will entail. He will do it because he will feel it to be right but also, of course, because that is the way to be re-elected in 2012, overcoming the fearsome challenge of Sarah Palin. 0727 Former Ronald Reagan aide Mark Neuman says Mr McCain always had a "steep hill" to climb, running for the Republicans, the same party as an unpopular incumbent president. 0722 The post-election party for McCain supporters in Phoenix, Arizona, is over. Hotel staff are clearing tables and the vacuum cleaners are out. 0718 A little more context for Mr McCain's performance. In terms of electoral college votes, he is currently on the same number - 159 - that fellow Republican war veteran Bob Dole took when he lost to Bill Clinton in 1996. John Kerry, runner-up in 2004, took 252 votes. Pity poor Walter Mondale, who managed only 13 in 1984. 0715 If it's "morning in America", it's probably nearing lunchtime in Mr Obama's mind, as he gets to grips with some longer-term thinking. His potential cabinet picks are provoking much speculation. Among the names mentioned are John Kerry, runner-up to George W Bush in the 2004 election, for secretary of state and Republican Colin Powell - who supported Mr Obama during this contest - for defence secretary. Camille in Cincinnati, United States, says: I hope the world can start to forgive us now. We missed you world. I'm sorry we were such brats. More of your comments. 0705 Mr McCain's running mate Sarah Palin looks set to avoid an embarrassment in her own back yard. The Alaskan governor's home state is set to remain safely Republican. That would guarantee Mr McCain at least 162 electoral college votes in total. A reader, the corner blog, National Revew: If the Republicans have any strategic sense at all. They should start working tomorrow to come up with thenext election plan. The Democrats are going to over-reach in 2009, they won't be able to help it. I think Obama is smarter, more politically adept and less mistake-pone than Bill Clinton, but also more ideological. Read more on The National Review. 0658 For those of you just joining us in the UK and the rest of Europe, the news is that Mr Obama has taken 338 electoral college votes - well above the 270 needed to become president. The states still to announce a result are: Montana, Missouri, Indiana, North Carolina and Alaska. Most still look pretty tight. If Mr Obama gets 350 college votes, that is considered by many to be a landslide. Atiq in Kabul says :We Afghans are extremely happy that Obama won the election as we are very hungry for change in our country. A change here is almost impossible without a change in Washington. More of your comments. 0651 Mwai Kibaki, president of Kenya, the home of Mr Obama's late father, says: "We the Kenyan people are immensely proud of your Kenyan roots. Your victory is not only an inspiration to millions of people all over the world, but it has special resonance with us here in Kenya." 0650 Following French President Nicolas Sarkozy's early example, world leaders have been offering Mr Obama their congratulations. Afghanistan's Hamid Karzai calls it a "great decision". Canada's Stephen Harper offers to "work closely" with the president-elect's team. Andi Ye in Otsu, Japan says:A new start, and a new chance; against all likelihood and in the face of huge adversity ahead. Let's hope it goes well. More of your comments. Diane Terruusa in New York says:For the first time in eight years I can travel overseas and across the world and feel proud, not ashamed, to be an American. More of your comments. 0638 In a sign of the times, Huffington Post blogger Mayhill Fowler tells the BBC that YouTube has been the "most influential player in this election". 0631 It looks like the celebrations are being repeated - albeit on a smaller scale - in many big cities. New York and Washington DC particularly appear to be in party mode. 0628 What scenes in Chicago. There must be hundreds of thousands - maybe the million forecast earlier - lining the streets of the Windy City.